Custom, authentic school certificates are a fitting award for your students and are sure to be treasured. 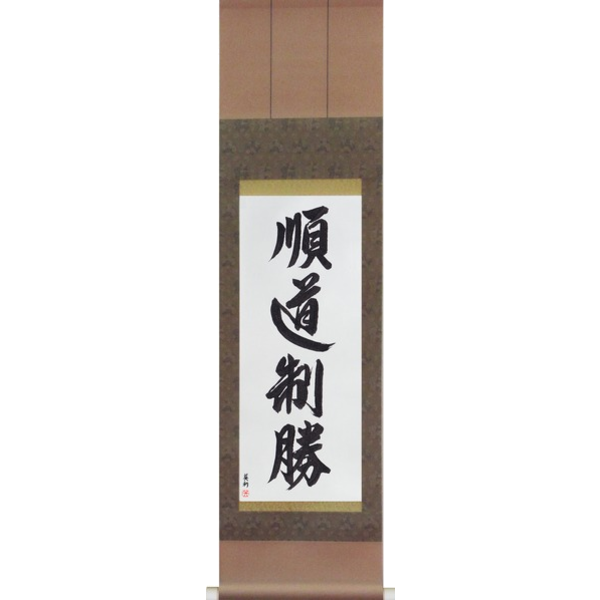 With your order, you will be working directly with Master Japanese Calligrapher Eri Takase to create an original certificate that has exactly the contents and look you want. For details, please see the details below. We take you through each step of the process including options for translation, fonts, and layout. We start with an initial sample set that has a variety of fonts and layouts. These hand-brushed samples are scanned and converted into a PDF file which we email to you. We then discuss the sample designs and modify as needed. And we continue in this fashion until the certificate is exactly the way you want it. This may be a single, individual certificate for a very special award or a master certificate where you can copy and fill in the details to create individual certificates yourself. Martial Arts certificates can be a work of art and a source of inspiration in addition to being a method of documenting student and instructor progress. At Takase Studios, we take great care in working with you on both the translation and layout to create a custom rank certificate that is just right for your school. We provide the individual attention and work directly with you to create just the right certificate. There are two common options that we offer. As below we can provide you with the main calligraphy for the certificate and a separate sheet with the ranks. These omit the name and date. You can then reprint the certificates creating individual certificates for your students. This is a popular option and an example is shown below. 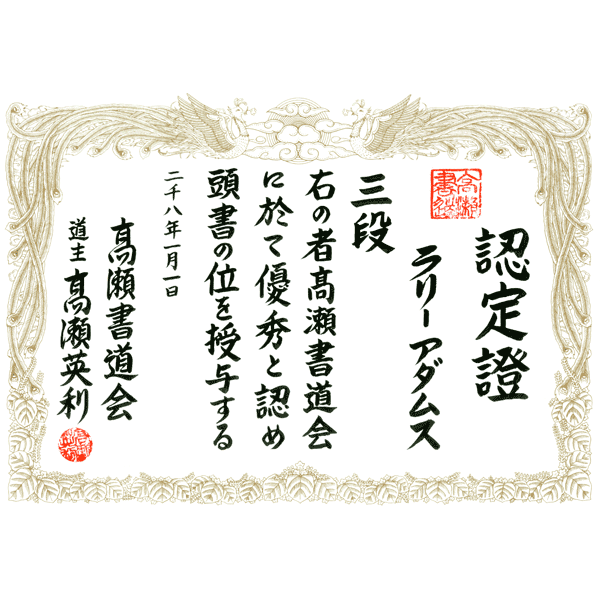 A second option is for Master Takase to make the entire certificate with all of the individual information. This is particular popular for very special certificates as shown below. Shown below is a standard rank certificate layout. As is customary with Japanese, the certificate begins on the right with the lines written vertically. The certificate is then read from right to left. A) Certificate. This is commonly either ninteisho as shown here or simply sho. Both mean Certificate. B) School Seal. This is the location for the school seal. 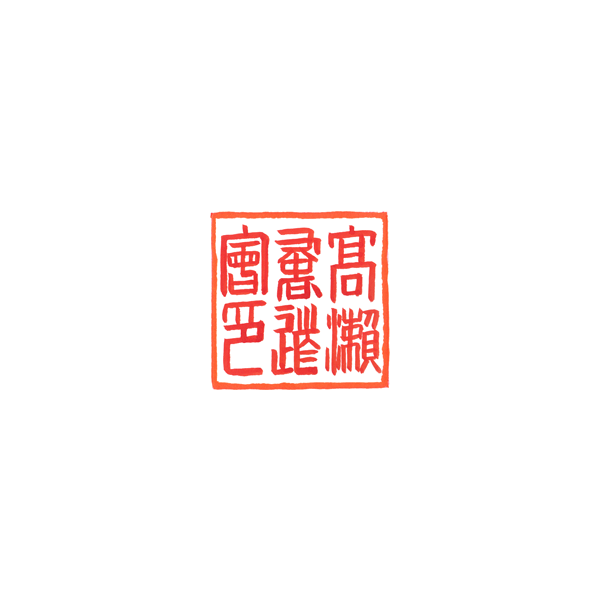 The school seal is always square and formal using the tensho or seal script. C) Student Name. On the master certificate, this area is left blank for the instructor to fill in the student’s name. D) Rank. This area is reserved for the rank being awarded. At Takase Studios we provide a separate sheet in a matching font a list of all the dan and kyuu ranks. F) Date. Dates may be entered in English numbers. Here the date is shown completely in kanji. G) Issuing Authority. Depending on the situation this may show only the school name or a second line may be used to show the parent association. H) Instructor (s). Typically one or more instructors, their title, and seal are placed in this final area on the left. To create the master certificate, we use an interactive process where we send you samples of the translation, layout, and fonts and based on your feedback make adjustments as necessary. This way you have complete control over the certificate design and you will know exactly what the certificate says and how it will look. Japanese certificates have a long tradition. This guides both the wording, the border, and the layout. While this is appropriate in many cases, each certificate is an individual work and has particular requirements that must be met. In some cases, English needs to be added to the certificate. Unfortunately, Japanese Calligraphy and English calligraphy are very different. In these circumstances, we recommend working with the copy company to include a suitable font and layout for the English. And work with Master Takase to create Japanese Calligraphy that does not change. And if you have questions, or would like to discuss your idea, please contact us or email Master Takase directly at Eri@Takase.com with further details. I received the certificate package yesterday. Everything arrived in perfect condition, your packing was excellent. I am thrilled with everything! You did a great job and I am completely satisfied. Your calligraphy is true art and I am certain all my students will be able to appreciate their rank certificates in that way. The extras you included will be very helpful, thanks for being so thoughtful. Working with Shihan Takase on the custom certificate design was a real pleasure. She combines a very strong knowledge of Shodo with great service and a dedication to make sure that the final product exceeds the customer’s expectations. Shihan Takase recently designed a master certificate as well as new school seal and personal seal for my martial arts organisation, it was a real pleasure working with a master again, her designs perfectly represent my organisations traditional heritage. On behalf of Shorinjiryu Koshinkai Karatedo Australia, we’ve had a couple of bits of work done by Takase.com. Firstly, we had new certificates done for our black belt promotions, and more recently we’ve had calligraphy done for one of our organisations maxims (On Ko Chi Shin). We’re really happy with the quality of the work (its outstanding), and Takase Shihan is incredibly responsive to our needs, taking great care to ensure that the final work is custom done to meet our needs. We are really happy with all her work, and would highly recommend Takase.com!